His family descended from German Lutherans who had migrated to the newly-founded colony of South Australia in the 1840s. “I am the eldest of three children and my parents instilled in all three of us the importance of Christian values and a love for God,” states 40-year-old Greek Orthodox priest Father Jeremy who also holds university degrees in electrical engineering and mathematical physics/pure maths. After completing his studies, the young scientist worked as a software engineer for the Defence Science Technology Organisation (DSTO) and later for a local internet start-up company, however, at the age of 28, Krieg found himself challenging his faith, as a result of someone who had lapsed in theirs. “I became ashamed of myself because in spite of a higher education that had equipped me to answer advanced physics, maths, and engineering problems, I struggled to answer some of the deeper questions about my faith; a faith that was supposedly an important part of my life. “It was then that I resolved to become more educated and ultimately to learn the truth about the faith and—if necessary—to change my life to accommodate whatever truth I discovered,” reveals Father Jeremy in a candid interview with Neos Kosmos. Unbeknown to him, Krieg's journey to Orthodoxy had just begun. Father Jeremy says what drew him to Orthodoxy was mainly the fact that the Orthodox Church does not compromise on its values and beliefs to satisfy the masses. “At the beginning of my spiritual journey, I had a preconception of the Christian world being divided into Roman Catholic and Protestant camps. I had always held a high view of the Sacraments, but I rejected the idea of a Pope. “In my limited view of the Christian world, Lutheranism seemed like the only real place that I belonged, yet even in Lutheranism, there were teachings that I was not comfortable with, that did not resonate as true. It was during this time that I discovered the Orthodox Church and my horizon suddenly expanded,” he says. 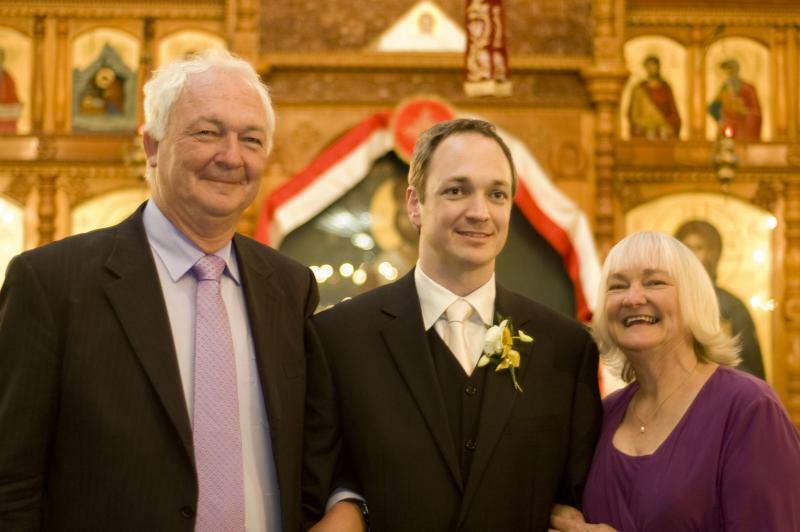 Fr Jeremy at his wedding with his parents Larry and Erica. The young scientist decided to formally commence studying theology in an attempt to learn more and investigate his own Lutheran tradition further. “Protestants are accustomed to thinking of the Christian world according to the so-called 'branch theory': the Church is like a tree, and each denomination a branch on that tree. While each denomination had its own errors, as long as they agreed on the essential doctrines, they would still be part of the tree. “The problem with this, as I soon began to realise, is that the denominations cannot even agree on which doctrines are the essential ones and as a consequence, they continue to widen the circle in the name of inclusiveness, by watering down the faith. Initially, Krieg started attending the local Lebanese (Arabic-speaking) Orthodox Church under the Antiochian Orthodox Archdiocese of Australia. In 2005 he was accepted into the Orthodox Church via Holy Baptism and began to attend fellowship groups for young adults at the Holy Monastery of St Nectarios (Greek Orthodox Archdiocese of Australia), run by parish priest Archimandrite Fr Silouan Fotineas. 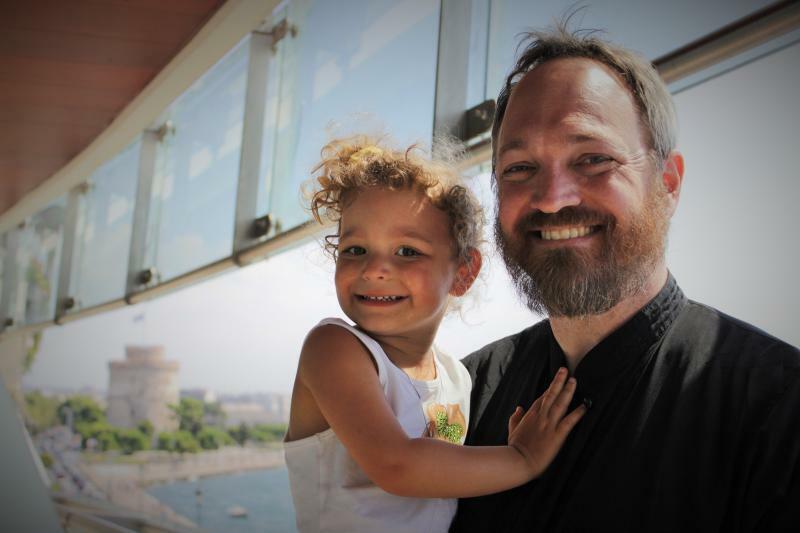 Two years later, Father Jeremy met his wife, now Presvytera Ioanna Krieg, whose migrant parents originate from Pontos and Ipeiros. The couple were married in 2009 on the Sunday of Saint Thomas. “Throughout this journey, I felt my relationship with God deepening and therefore I decided, in consultation with my wife, that I wished to serve God in whatever capacity He laid out for me. I involved myself in parish life at St Nectarios, joining my wife on the parish committee, teaching Sunday school and chanting,” explains Father Jeremy. The couple's involvement came to the attention of Bishop Nikandros of Doryleon, who in late 2011 asked Krieg if he wished to become ordained. 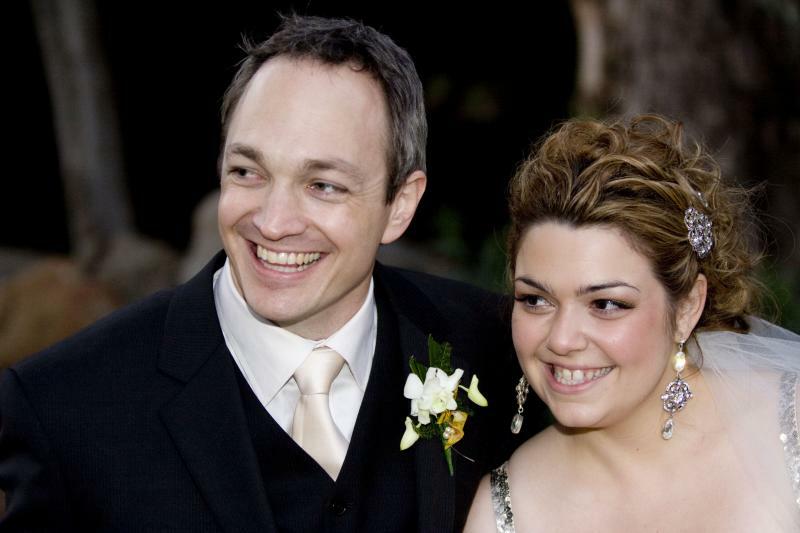 Fr Jeremy with his wife Ioanna. “Knowing that in Orthodoxy our bishops are guided by the Holy Spirit to make such decisions, and with the guidance of my spiritual father, I accepted the call,” says Father Jeremy who is the first non-Greek clergy of the Archdiocese in South Australia, and only the third in Australia. Father Jeremy served the Archdiocese in a full-time capacity and was also appointed Chief Executive Officer of the Greek Welfare Centre SA, St Philothei. In both roles, the determined priest tries to converse with many Greek parishioners in their native language and he reveals that his Greek is improving daily with the help of a very special teacher. “While I was able to read Greek through my theological training and experience on the chanter's stand, speaking modern Greek was another skill altogether, therefore, I study Greek together with my four-year-old daughter who came into this world less than one month after my ordination to the priesthood, on the feast day of St Stylianos and she was named in his honour. As to whether it has been an easy transition from science to Orthodoxy, Father Jeremy seems to really be enjoying being the 'Αυστραλό' (Australian) priest. “Everywhere I have been, whether in South Australia, interstate or abroad, I have always been wholeheartedly received by my fellow clergy and laypeople, even though I am a ξένος (foreigner)” explains Father Jeremy. “In fact, I think that the sheer novelty of me being an Αυστραλός often causes them to overlook my many weaknesses, when people would have been less forgiving if it were my fellow clergy. With his daughter Styliani in Thessaloniki. “I also find that simply being the Αυστραλό priest, in a way that words alone could not achieve, is often a good way to reach out to cradle Orthodox and to motivate them to think more deeply about their ancestral Faith, because Orthodoxy is not just for Greeks, Serbs, Russians, Romanians and so on, nor should we remain Orthodox simply because we are Greek and that's what Greeks unfortunately do. “We should remain Orthodox because we recognise that it is the true Faith and is the fullest expression of God's love on this Earth. “I hope for others to look at me and fellow Australian priest father Daniel (the second non-Greek Orthodox priest in South Australia) and feel inspired to investigate religious matters further, grasping the fact that the religion we serve doesn't separate people in categories; on the contrary, Orthodoxy belongs to everyone. “It is Christ in His purest form on this Earth and there is no higher reward than finding the truth,” concludes Father Jeremy.